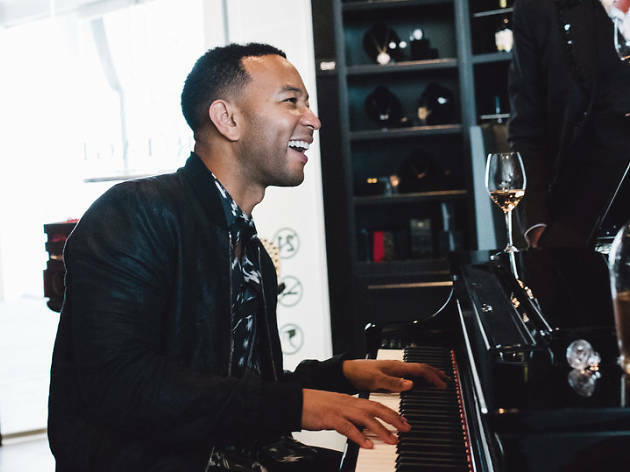 John Legend is about all that bubbly, all that wine in his lyrics, but don’t believe for a second he’s not living his words. The singer-songwriter’s picked up an Oscar and multiple Grammys, and, of late, he’s added “vintner” to his impressive CV with his own wine label, Legend Vineyard Exclusives. 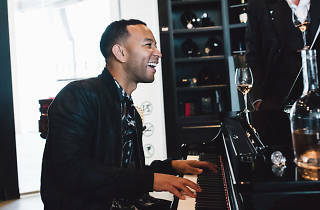 Now, thanks to a partnership with one of Beverly Hills’ chicest wine bars, he’s got his own pop-up where you can taste all four of his varietals and get lifted—and maybe catch a glimpse of Legend sitting down at the piano. Héritage Fine Wines, sitting a block from the iconic Beverly Hills sign, just launched a tasting-room pop-up for LVE, Legend’s collaborative label with Napa-based winemaker Jean-Charles Boisset of Raymond Vineyards. During the run—which doesn’t have an end date, as of now—wine enthusiasts can sip the LVE portfolio, as well as selections from Boisset’s own line, JCB Collection, which offers 40 varieties. Tastings are available in four wine-flight options, and range from $25 to $45. As for special appearances, you can bet Legend will stop by every so often, perhaps even sitting down to play a song or two in the organic-wine-focused bar and bottle shop—which also doubles as a French café with regular music nights and, more recently, rooftop events. Since 2015, Legend and Boisset have created a handful of critically lauded wines, including their 11-month-barrel-aged chardonnay made by marrying Old Wente and Clone 15 vines; their cabernet sauvignon, a dark, rich blend of four grapes harvested from six different vineyards; and the red blend, a 26-month-aged combination of petite sirah, merlot, cabernet sauvignon and petit verdot. The latest LVE wine, a Côtes de Provence rosé, relies on gently-pressed grapes from the Montagne Sainte Victoire region, giving off “delicate notes of peach blossom, raspberry and apricot.” This blend recently hit the market in June; currently, the only L.A. location where you can pick up a bottle is at the pop-up. Héritage is located at 467 N Canon Dr, open from 11am-6pm Monday, and 11am-11pm Tuesday to Saturday.